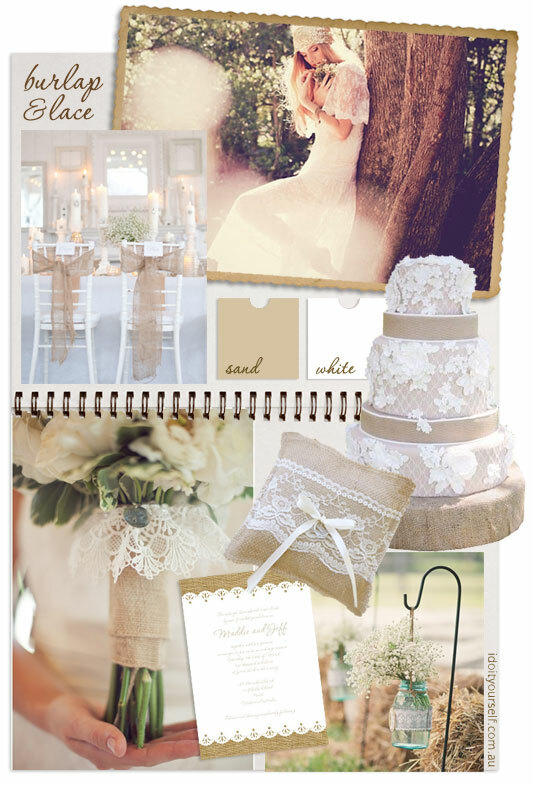 When we started to put together this months mood board of burlap and lace, we knew it was going to be a long month ahead. There are just so many possibilities with this wedding theme. Plenty of easy DIY ideas to try. So with a colour palette of rustic sand brown and white let's get started. Credits: Burlap ribbons on white chairs via Wedding By Lily, French lace wedding dress from Australian designer Grace Loves Lace. Burlap and lace wrapped bouquet via pinterest, burlap and lace wedding invitation from 'i do' it yourself, burlap ring bearer pillow with lace US$20 from Butterfly Above, cake unknown, lace wrapped jars via the knot.